Over the course of the last few years, comic book author / illustrator Ben Sears has been steadily churning out inviting and impressive books, comics, shirts, and prints. 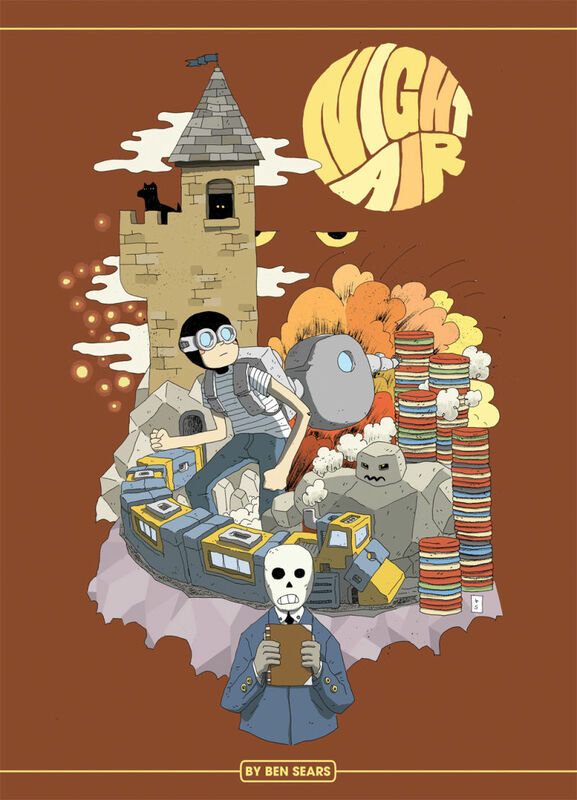 Teaming with Koyama Press for one book a year, Sears officially launched the Double+ character adventure series back in 2016 with the book Night Air. 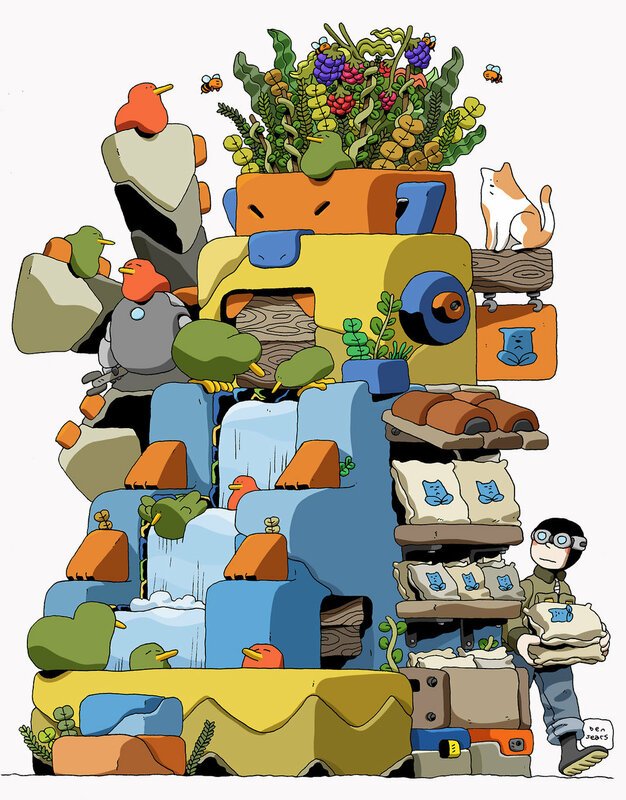 The graphic novelist followed up with 2017's Volcano Trash, and will continue in May of this year with The Ideal Copy. Meshing sci-fi, comedy, and action into one signature style that's welcoming for all ages, Ben Sears has been building his portfolio one release at a time. With a bulk of public appearances and events planned for spring and summer (see poster below), I talked to Sears about his creative freedom, his evolution, and the importance he places on practice and patience. Oh yeah, and robots. I saw on your Instagram where you posted a piece of Double+ from a 2014 sketchbook. Has that character/world been in your head for quite some time? How has your technique/discipline changed over the years? The main character came from a sketch I did in the fall of 2013. I kept drawing him in different robot suits and vehicles, and the story just built up around that. The art style and stories have gone in a direction I wasn't anticipating, but it's happened organically and I'm happy with the results. Volcano Trash isn't quite a year old and you already have something planned for this spring/summer. Are you trying to release something every year? I actually finished Volcano Trash back in July of 2016. I wrapped up The Ideal Copy back in August of 2017, and I'm working on the 2019 book right now. My Koyama books come out about a year after I've finished them, so by the time a book is out I'm already halfway done with the next one. For the foreseeable future, I'd like to have a longer book out every year. I try to put out at least two minicomics every year, regardless of what else comes out. What's your creative freedom like in regards to working with Koyama Press? Pretty much total freedom. Annie and Ed provide minor editorial feedback, usually just limited to grammatical errors. I'm very fortunate, they're supportive of whatever story I want to write/draw. Your IG feed is a mixture of drawings and cats. What other elements/characters form your life? Not sure I understand the question. If you're asking if I base any fictional characters off of people in my life, definitely. Not any one person in particular, though. I like making up characters based on cashiers, delivery people, or other people I have a single, short interaction with. It's more enjoyable to come up with a backstory for someone I don't know. I don't have a lot of time to read books, but I did reread The Westing Game for the first time since I was a kid recently. I remember liking it growing up, but it was a lot denser than I remembered. Lots of good character development and depth. I'm reading the complete Peanuts and have made it to the mid 60s. I didn't read it much growing up, so experiencing it as an adult is nice. I've never read a comic that can consistently land gut wrenching humor and depression, as well as subtle jokes or melancholy. All of the cartooning is perfect, regardless of the era. Richie Pope's shorter comics from 2017 (Super Itis and Fell Down A Well) are inspiring in their simplicity and efficiency. Dustin Harbin and Mason Dickerson's recent mincomics have been great, too. They're both stylistically fully realized, but still finding ways to accent their colors or linework. Anya Davidson, Sophie Yanow, Tonci Zonjic, Wai Wai Pang, Joe Decie, and Nadine Redlich are always posting drawings that make me stop and study. It's hard to name everything, because there's such a surplus of people whose work makes me happy. What's the art scene like in Louisville? It seems to be doing okay, I'm not really involved with it. Carmichael's Books, Ultra Pop, and The Great Escape all carry my comics and I'm grateful for that. Mind Spiders and Calibro 35 both just put out good albums. Other than that, Tommy McCook, HUM, Delay, Stone Roses, Kenny Dorham, and Manaka Kataoka's Breath of the Wild soundtrack have been on regular rotation. Practice. I don't subscribe to the myth of being born with talent. Things might come easier for some people, but practicing and never being content has gotten me places I never thought I'd be. I guess patience is a big part of that, too. There's also a fine line to walk with being proud of yourself, but staying humble. Make sure your physical and mental health take precedence over your work. If you're working on comics or illustration, odds are you aren't getting paid enough to destroy your body and mind. The work will be there when you get back.